The docks and boats that ferry visitors across the “big” lake. This photo was taken quite late in the day, which is why you see some people in the picture but not that many. Tuesday morning I woke early, and despite turning the light off in the bathroom, I could still hear the fan running. Oh wait! 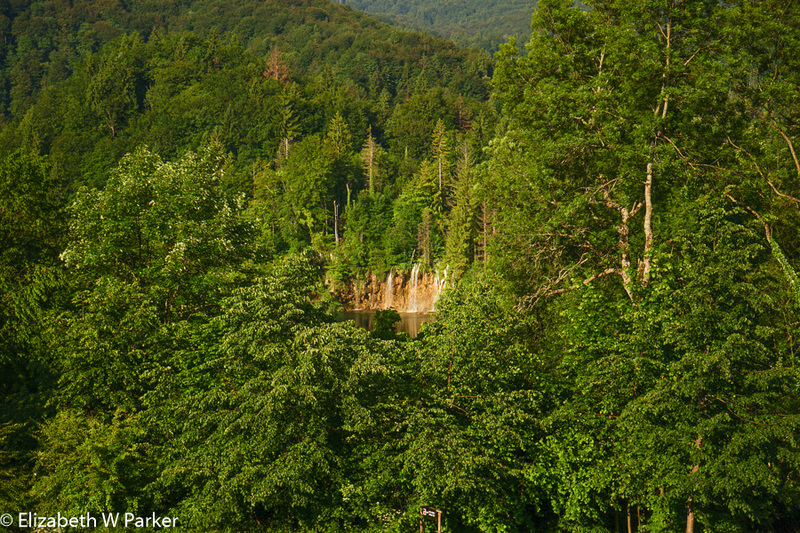 That isn’t the fan – that is the water from the falls in the park! This was my first view of the water, seen as we were walking to catch our boat… What a tease! 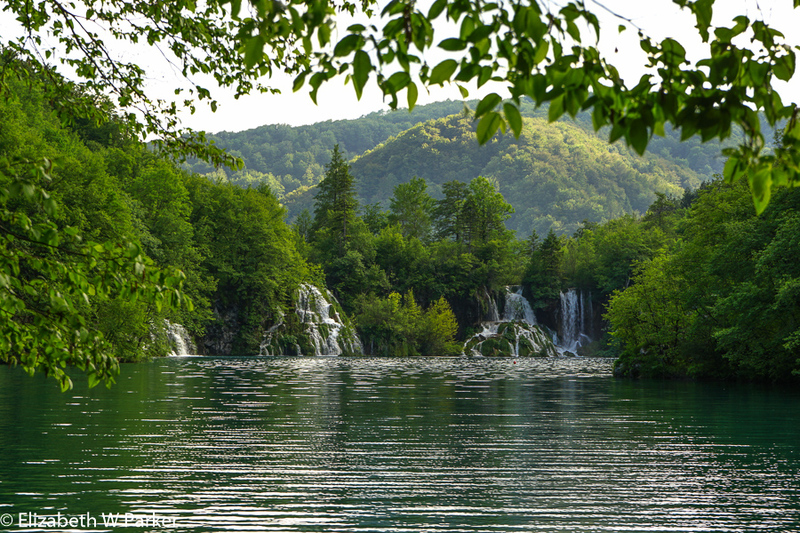 The Plitvice Lakes National Park is chock full of waterfalls! The park is very large and very important to the ecology of this region. It is full of wildlife, some of it fairly rare. But the focus of the park, and the reason it has over a million visitors a year (and you have to realize how remote it is before you judge based on numbers alone), is the water. Countless lakes filled by water runoff from the surrounding mountains, are chained together. 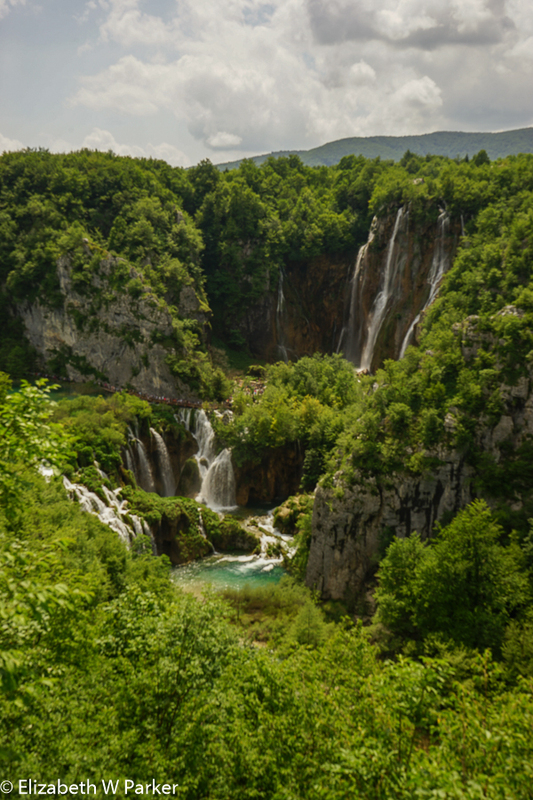 The water flowing out of the mountains is rich in calcium carbonate, which gets deposited as the lakes overspill their banks and the water cascades down to a lower level. Over the eons, this has created a chain (lake, waterfall, lake, waterfall, etc.) that is still changing and growing. What we see, in the brief geological nanosecond we are here is fantastic, unbelievable beauty. 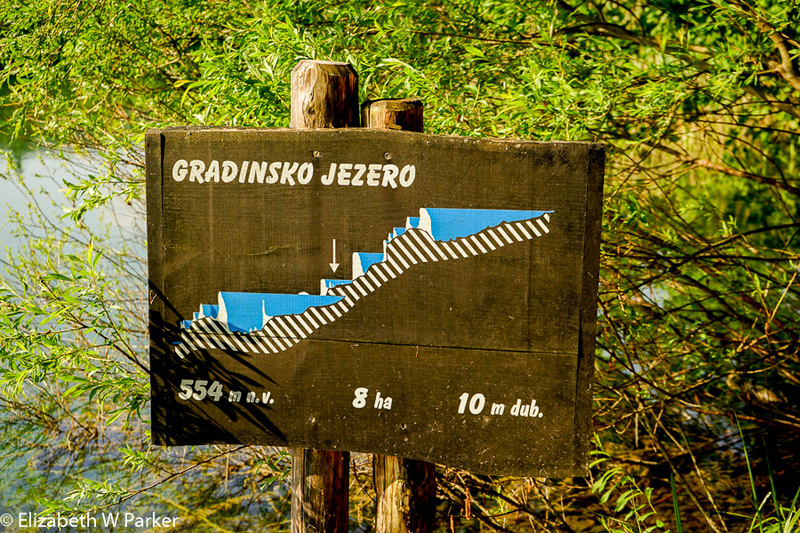 This image explains many things: (Jezero is the Croatian word for lake). The arrow shows you which lake in the chain you are looking at: One of these signs appears by the trail at every lake in the chain. Focus on the white hills protruding up from the cross-hatched rock bed. Those are the tufa barriers that create the falls. They are still growing. You can see some that have been superceded too. We wanted to get out early to see the waterfalls, so left the hotel at 7:45 to make the 8:00 boat. We got on the first boat (alone) to cross the lake and pretty much had the place to ourselves for the first hour and a half. That was a luxury we could hardly have hoped for, as tourists are brought in by the busloads. Even at noon, though we found it crowded, we were thanking our lucky stars that this is the final week of school, so the crowds are still a fraction of what they will be in mid-July and August! Fortunately, I will not have to remember it with crowds. I will remember it as one of the most spectacular things I have ever seen, and I have never seen anything like it. I walked along the paths that follow the lake shores and cross the waterfalls, marveling at the sound: As you leave the falls, the noise drops off. You can hear the birds, admire the fish in the clear water, marvel at the bullfrogs who sound like nothing less than drug-crazed ducks(!). Then, as you continue, the noise starts to build and you find the next set of falls. Now the rushing water noise reaches a crescendo. Yet, it attenuates again as you pass those falls and turn your attention to the next lake. Here the water is, like in Slovenia, turquoise in the sun, and a deep aquamarine in the shade. White as it rushes over the barriers it has built up, it sluices around clumps of plants and trees, whose roots are embedded in the rock, called tufa or travertine, that results from the calcium carbonate deposits. There are high falls, with long thin streams, and high falls with fat streams; there are medium falls that branch out each time they meet an obstacle, and there are small falls that seem to come out of nowhere. The water runs slowly in from pool to pool in wide areas and rushes in a mini torrent where the space is narrow. There is so much variety, I could never describe them all. Enjoy the slideshow! We walked about 7 miles in the morning, covering all the “Upper Lakes” and by mid-morning the number of other visitors was beginning to get a little obnoxious. We took a break for lunch at a newly reopened restaurant in the park. The food was hearty – good thing as our morning walk was close to four hours and we were famished. After lunch we took a look at the “Big Falls” from an upper observation point right near the restaurant, but returned to the hotel for a rest…and to let the crowds go home. Oh-oh! What are we in for? 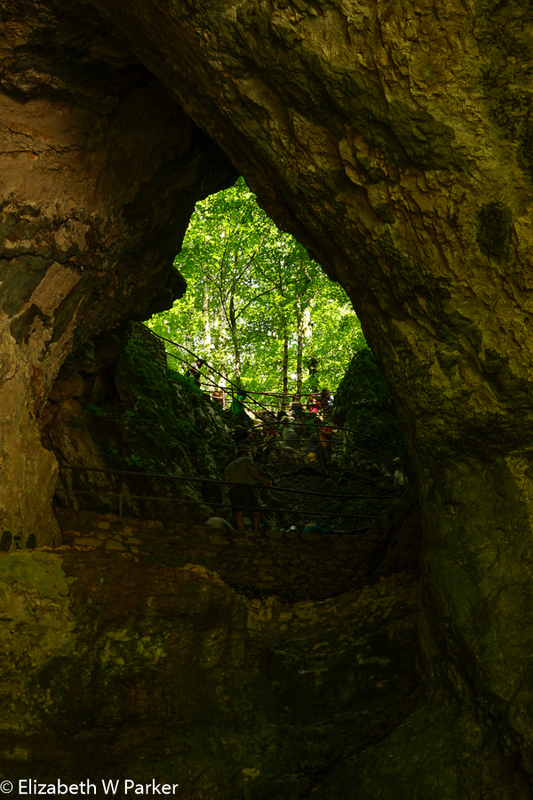 Around 4:15 Galina and I met Dave again and headed back into the park to visit the “Lower Lakes” and the “Big Falls.” Our trip began with a short tram ride, and then a harrowing walk down steep, wet steps through a natural tunnel in a cave. 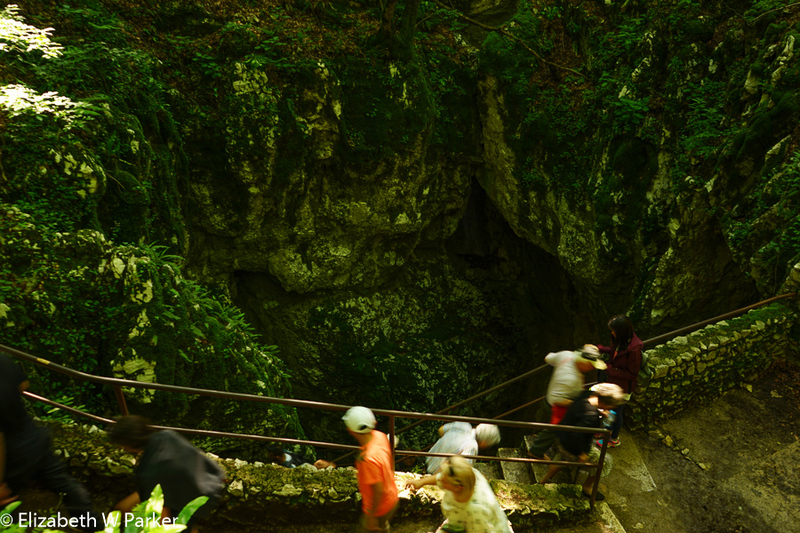 It was mostly harrowing because the stairs were narrow, and people were walking up the other direction, and because the cave was dark and the steps were wet. I took heart when I saw some of the shoes the people walking up were wearing. 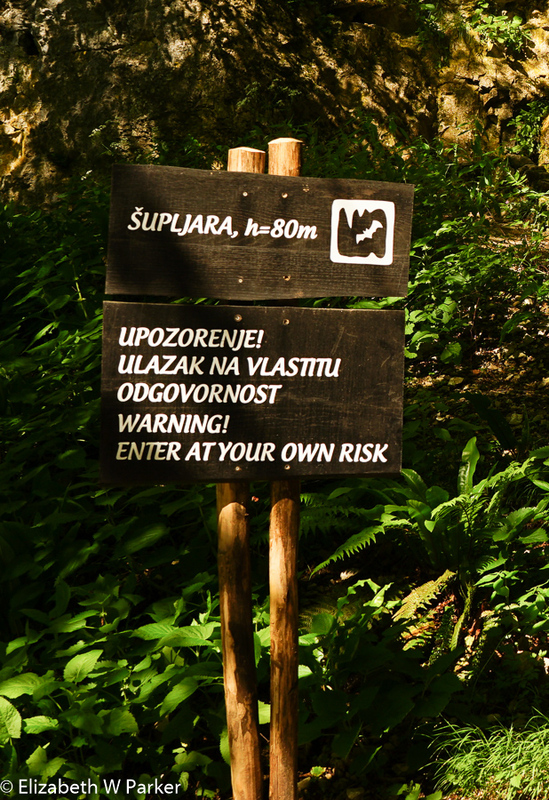 I was sure that I, in my hiking boots, would be better off than people in open-toed, heel-less sandals! That’s the hole we are going down into. Notice how fast the people coming up are trying to get out of it! Once out the bottom, I had to look back up. Slippery, but could have been worse! It turned out to be an “experience” but not a bad one, and easily forgotten once we were down among the lakes and falls again. This lower section is not nearly as dramatic as the morning section, but it is crowned by the grandiose view of the Big Falls from the bottom. We turned back and walked the full length of the lower lakes until we reached the biggest lake (the dividing pointing between the upper and lower sections, and then took an electric ferry back to the dock nearest the hotel where we started out at 8 am. That long ferry ride, the boat silently gliding across the surface of the lake seemed the very best way to end a day filled with sights totally new and wondrous. Tuesday evening we celebrated the culmination of a successful trip with champagne and toasts to our guides and the weather gods who graced us this past week. Next Up: A day in Zagreb!